The Red-winged Blackbird is found in marshes and meadows. In central California this bird has no yellow on the shoulder patch, they are sometimes called Bicolored Blackbirds. 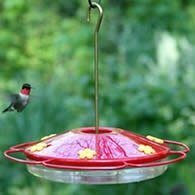 Males defend a territory of 1/8 to 1/4 of an acre by singing from perches with wings spread open and red shoulder patches exposed. 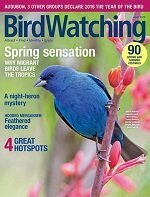 Wintering in the southern states, these birds head north at the first hint of spring. The males arrive first with the females arriving several weeks later. The Red-wing Blackbird is 7 to 9 1/2 inches in length. The male bird is black with red shoulder bordered with yellow. The female is brown above and heavily streaked brown below with a sharp-pointed bill and a buffy, whitish eyebrow. The young males are similar to the adult female bird, but darker and with an orangish shoulder patch bordered by white. Female young are like adult female. Older males arrive first, staking their territory and defending it against other males. 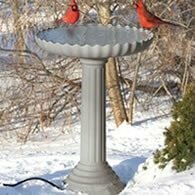 You may see them in early spring at your feeders. These birds are polgynous, averaging 3 mates per breeding season. The breeding season can start as early as Feburary and go through to August depending on location with the peak being mid May to July. Once territories and mates are somewhat established, first year males appear. Older males will chase the younger males away. The young will gather in bachelor flocks and wait until next year. The nest is built by the female and is cup shaped, made of grass, lashed to reeds or in small bush. Both male and female will defend the nest against predators. The female lays and incubates 3 to 5 pale blue, marked with zigzag lines of brown or blackish eggs. 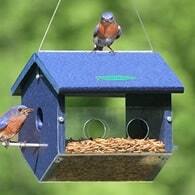 Incubation will last about 12 days and the young will leave the nest in 10 to 13 days after hatching. 1 - 2 broods raised each season. The Red-winged Blackbird feeds on seeds, grain, insects and spiders. 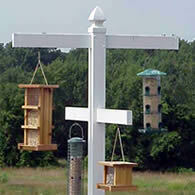 Will come to birdfeeders for cracked corn or seed mixes. Sometimes arrives at feeders in large flocks. In fall, huge flocks will congregate and roost together. The video below shows thousands flying into a local wetland area to roost for the night. The video was taken October in Kansas. Grackles and other species are included in these large flocks.